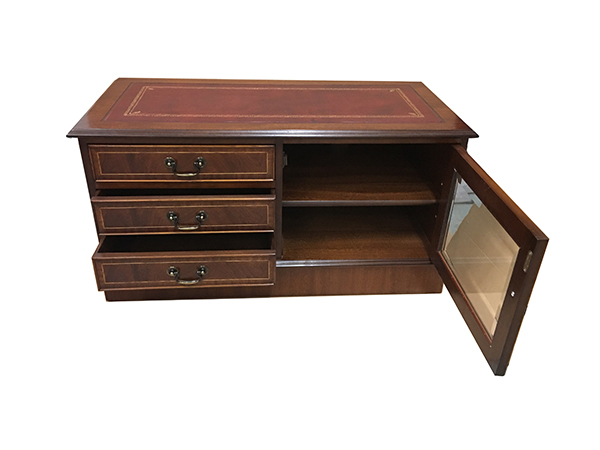 All of our DVD and Video Cabinets are available in Mahogany and Yew and can be made to your own specifications and dimensions. 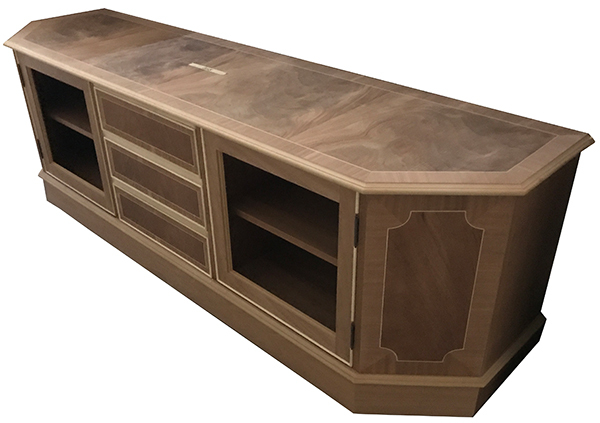 We can manufacture a bespoke cabinet for you from your own required sizes along with a diagram of how you would like the unit to look. For more information please call on 020 8443 2827. Some of the pictures below have been photographed prior to polishing, but should still give a good idea of how the finished televisions stands/cabinets will look. 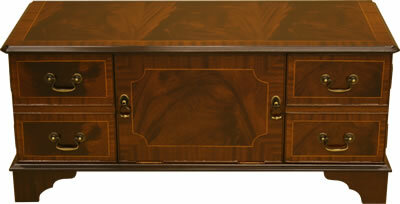 Behind chest fronted drop down door is an open unit for Video/DVD player and Digi Box with Cut out hole for wiring. There is 1x Fully Adjustable shelf internally. 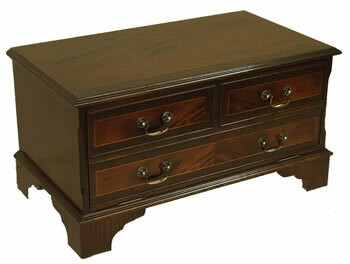 The cabinet is available in Mahogany and Yew finish as standard but can be manufactured in Oak or a variety of other woods. 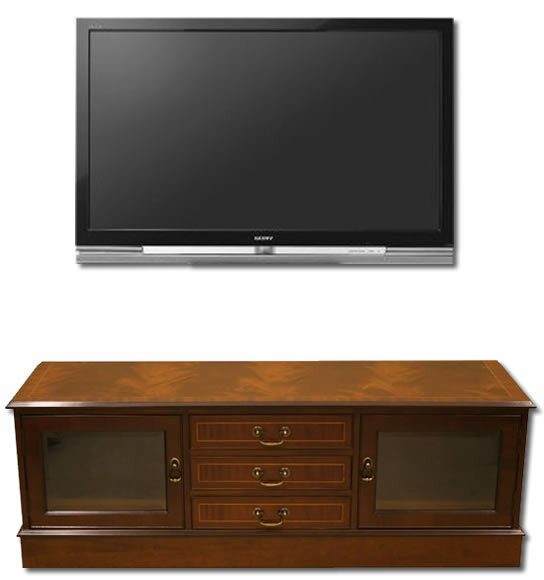 If you require a specific sized unit for your television, Plasma or LCD TV we can manufacture to your own dimensions. Please contact us for a quotation. 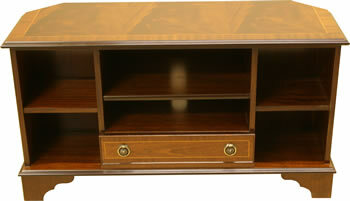 Internal sliding shelves for DVD player and Digi Box with side storage compartments. 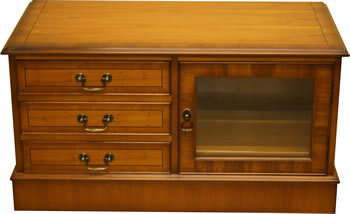 Internal Fixed shelves for DVD player and Digi Box with side storage compartments. 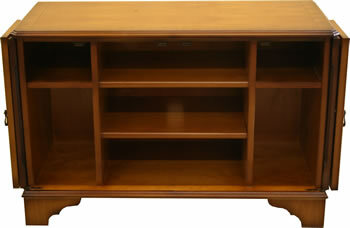 Internal shelves for DVD player and Digi Box with side storage compartments. 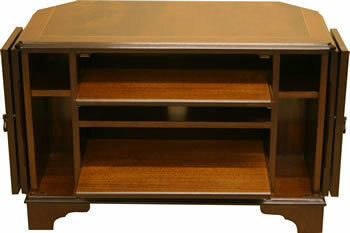 This television stand has a bottom drawer for DVD storage or any other storage requirements. 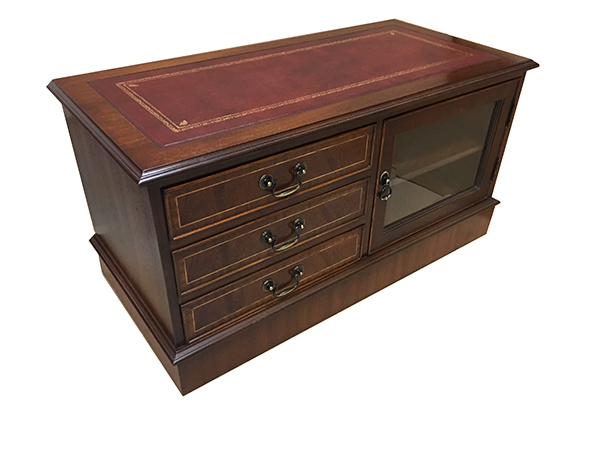 Behind the pull down chest fronted flap is one fully adjustable internal shelf for DVD player and Digi Box. 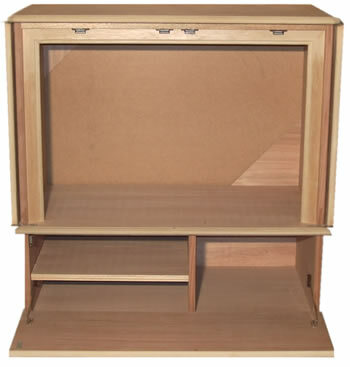 This cabinet has the option of a Solid Flap instead of Glass but would need to be stated when placing your order. Plain glass is standard. For Glass with Bevell please add £30. 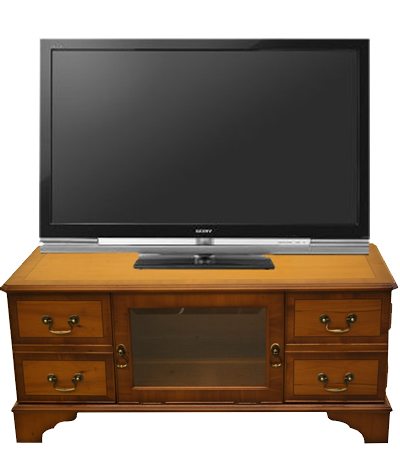 The benefit of this cabinet is that it is ideal for the larger Television and by having the glass flap, you are able to control your Sky Box, DVD/Blu Ray Player, Digi Box, Video Player, etc. whilst the flap is closed. 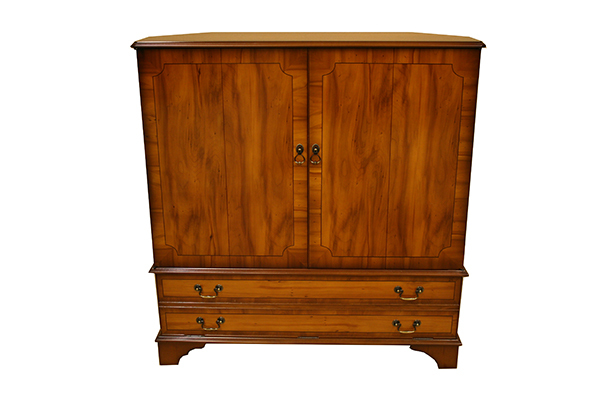 This cabinet is available in Mahogany and Yew finish as standard but can be manufactured in Oak or a variety of other woods. 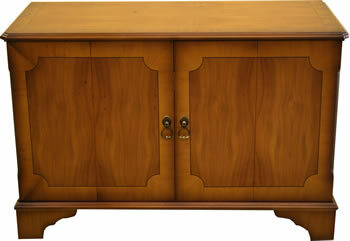 This cabinet has 3 Drawers and one cupboard section with a Glass Door. Within the Cupboard is 1x fully adjustable shelf. 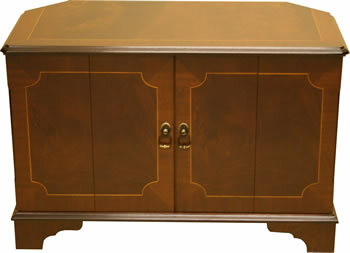 This cabinet has 3 Drawers and two cupboards with Glass Doors. Within each of the Cupboard sections is 1x fully adjustable shelf. 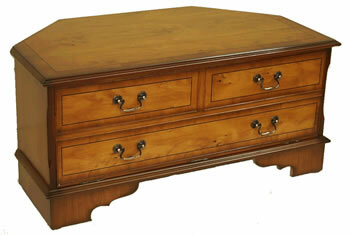 With bottom flap for DVD player and Digi Box and other storage. Extra holes can be cut into the back for wiring if required. 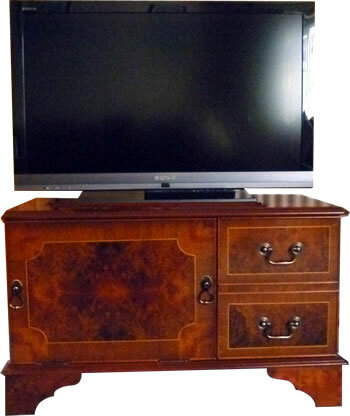 Left hand drop down flap with 1x fully adjustable shelf for DVD player and Digi Box. Behind the right hand door is 1x Adjustable Shelf. As you can see from the customers design above, we can manufacture to your own specifications to meet you exact requirements.